Recently the Missouri Department of Agriculture issued proposed regulations as required by law to fully implement the Canine Cruelty Prevention Act (CCPA). This new law establishes increased standards of care for dogs housed in commercial breeding facilities in Missouri. One very important piece of this law is the requirement for an annual veterinary exam which is essential to protect the health and physical welfare of these breeding dogs. At the time this CCPA compromise legislation was worked out the Missouri Alliance for Animal Legislation, the Humane Society of Missouri and other animal welfare groups insisted an annual vet exam of each dog be written into the CCPA. As written and passed by Missouri lawmakers, the new CCPA law requires dog breeding facility owners to provide "necessary veterinary care" for each dog over the age of six months. This is further defined as "at minimum, examination at least once yearly by a licensed veterinarian, prompt treatment of any serious illness or injury by a licensed veterinarian, and, where needed, humane euthanasia by a licensed veterinarian..."
Now the Missouri Department of Agriculture is feeling pressure from commercial dog breeders to weaken this provision to require only a "visual inspection" of the dogs rather than a complete hands-on physical examination. Many of these breeders are even insisting that the dogs do not need to be removed from their cages for this required annual examination. Predictably, one of their main concerns appears to be the added expense of a hands-on exam versus a visual inspection of their dogs. An adequate veterinary examination is crucial to ensure the welfare of dogs in mass breeding establishments. Most responsible companion animal owners take the time and spend the money to have their dogs physically examined by a veterinarian at least once a year. 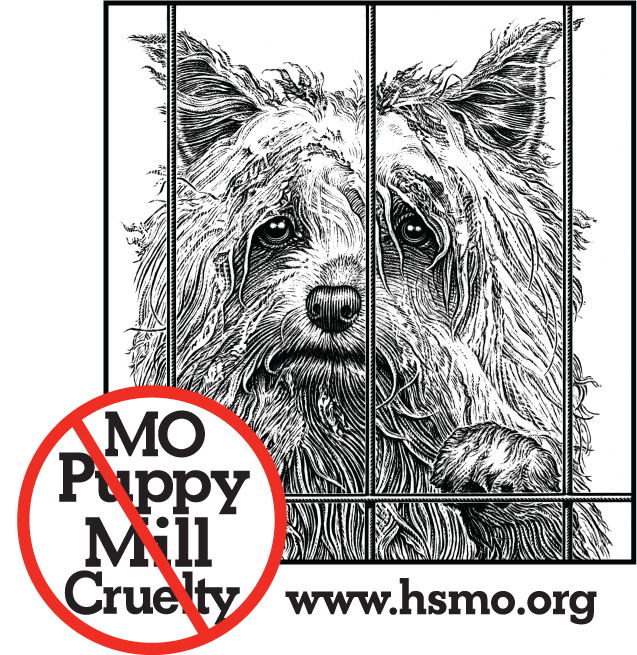 Commercial dog breeders seek to make a profit off their animals. They should be expected to provide an appropriate level of veterinary care, especially in light of the dogs' constant stressful living conditions and the intense physical demands of incessant breeding, pregnancy, nursing puppies, and so on. No reasonable person taking their dog to a veterinarian for an "examination" would be satisfied if the vet merely looked inside the carrying crate and deemed their dog to be healthy. 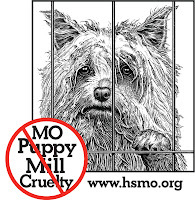 Yet this is what many commercial breeders in Missouri have accepted for years as adequate standard procedure, and this is what many are demanding once again. What can you do? The official comment period for changing or approving the proposed regulations ends on September 30. Missouri's state veterinarian, Dr. Taylor Woods is in charge of the regulations. Write a letter to Dr. Woods urging that "veterinary examination" in the regulations be clearly defined as an annual "hands-on physical veterinary examination." And that this mandatory requirement be specifically written into the regulations. Go ahead... bark at us! Therapy animals, Emotional Support Animals, and Service Dogs: Who can be what? For Love of a Dog Talkings Dogs Blog. Simple theme. Powered by Blogger.